When I design something I often think "down the road" which drives the rig construction using modules and access to the various circuit boards. I also think about using the rig itself as an experimental platform. My thoughts also consider where the "hobby is" relative to what I am building. If you open a new buggy whip factory you must think seriously how many would actually be sold/used. For a variety reasons many in our hobby have moved from the standalone rig to one that is mated with the power of a computer. I recently heard a big time 160 Meter DXer who lamented there were no longer DX SSB/CW ops on that band--all of his friends are now on FT8. The digital modes can be done at QRP power levels and modest antennas. The playing field is "leveled" with the digital modes! The Sudden Transceiver fits in the framework just outlined and thus the decision to test the Sudden Transceiver using the digital modes. In my mind the Si5351 PLL gives the needed stability to "do digital". I have serious reservations that with an analog VFO it would be possible to operate the digital modes. There are those who will tell me --you are wrong -- but just yesterday the Sudden Transceiver started operating digital when the garage was a cool 68 F and worked flawlessly with no frequency movementt when it hit 100F late in the afternoon. Try that with an anlog VFO! Then of course there are those who want to do FT8 --well it does it just FB. Here is a snap from 8/23 at 8 AM in the morning using a droopy dipole. So the receiver side is quite good for this mode. Keep in mind this is 40M with a less than ideal antenna. The external harware consists of digital inteface to the computer sound card. This sounds really exotic but is nothing more than three diodes, three resistors, two capacitors, two modem transformers, an optical coupler (4N25). 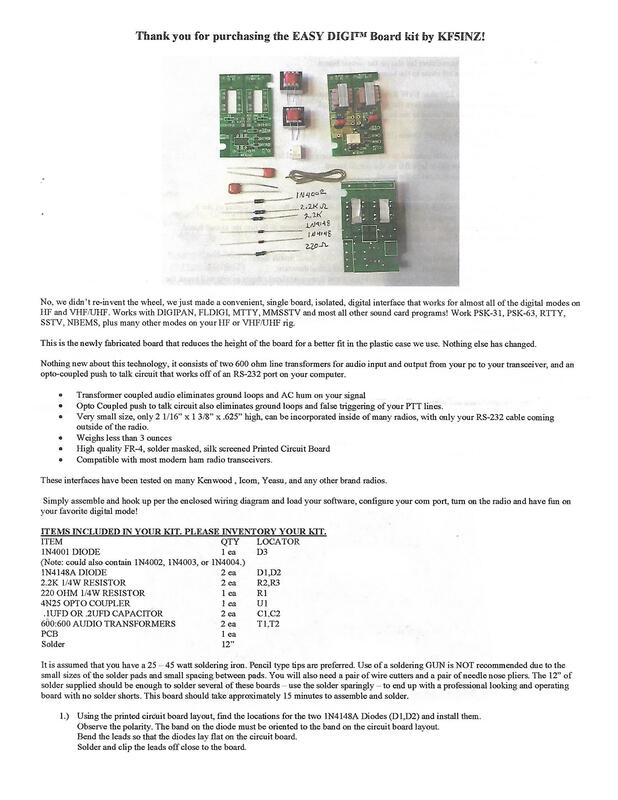 This is something that could be homebrewed but I bought a kit for less than $10 delivered to my door. 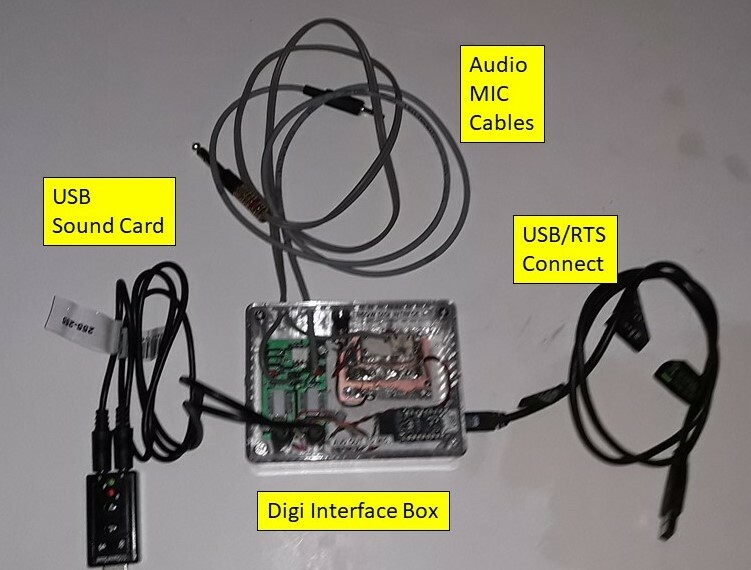 Essentially this kit provides a somewhat isolated interface to the computer and provides a means of using the transmit command from the program to "turn on" the transmitter for sending the digital information. Hidden in the interface are various methods for causing the TR and these are selected in the WSJT-X program. I am using COM 1 and DTR. 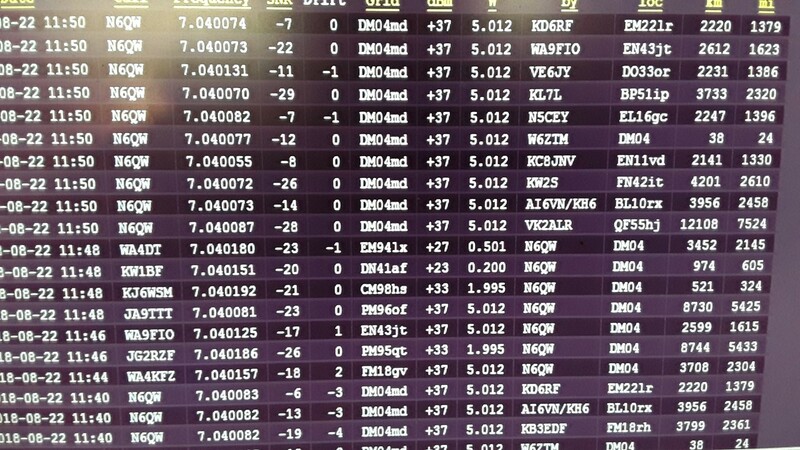 You also enter into the WSJT-X program your call sign and grid square location (WSPR, JT8) and power level for WSPR. 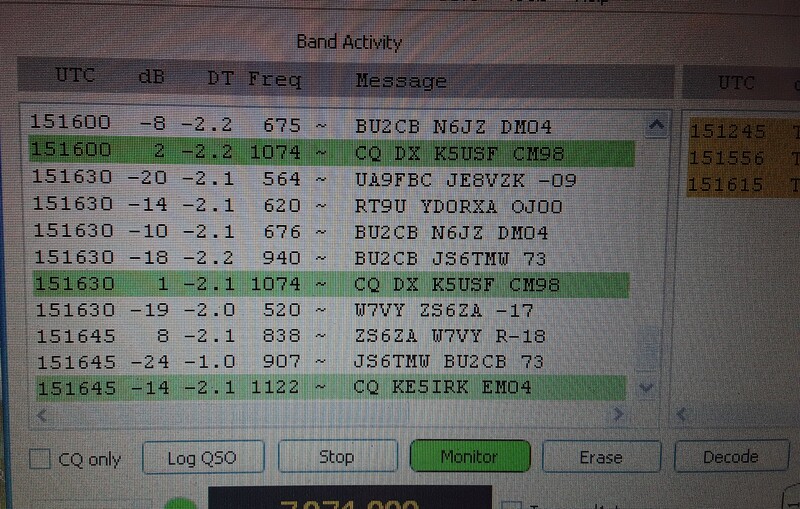 Variants in the program for other digital modes (FT8) let you create custom messages such as your qth, name etc. Here is the link to purchase this kit. The are sveral sets of connections to/from the interface board. One set of connections to the board includes the microphone input and audio output to the Sudden Transceiver and a final set of connections to the PTT keying circuit. The final set of connections to the board is the interconnection to the computer serial port which provides the opto-isolated command signal to trip the PTT. Since building the initial setup I am looking at an optional method to key the transmitter. Most modern computers (last four years or so) lack a Serial Port as that interconnection has shifted to USB now on USB 3.0 (read fast). However most USB connections have four pins with two associated with data and the other two 5 VDC and GND. 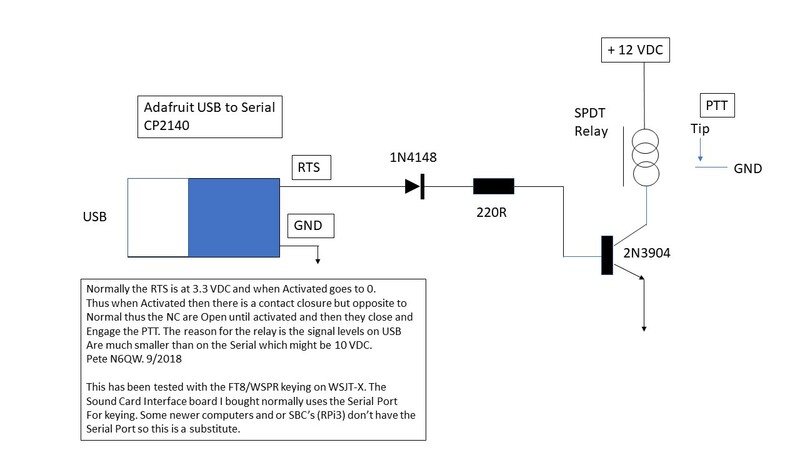 The sound interface card needs to be keyed either with the old time DTR or RTS signals (BTW these are vintage protocol used with Teletype Signals --jokingly DTR has been decoded as Don't Touch Radio and RTS really is Return To Sender). So there appears to be a problem of how to key the transmitter with a modern computer. Possibly not! I just spotted a device from Adafruit Industries that is USB but you can tap into the DTR or RTS signal paths. USB to Serial It is a modest price of about $15. I bought this device and have successfully implemented it into the system. Basically the issue is one of voltgae levels. The Serial connections can have 10 Volts on the pins whereas the USB are either 3.3 or 5 Volts. I came up witha circuit using a 2N3904 and a DPST relay so that the lower voltages coming out of the USB controls the relay contact closures so that the PTT is tripped from the relay and not directly from the USB. It works and is now installed in the system. The schematic is shown below. I could spend hours and hours trying to describe the set up of the software but an easier way for both you and ME, just visit youtube and type in FT8. Just watch the videos and you will see what you need to do. The setup panel asks for a rig -- I use None as my rig is not listed. Set the audio level so that it shows GREEN, Yellow is too Low and Red is too High. You should see both activity on the Panels and/or the Waterfall. If you don't see the activity you either have a very dead band or somnething is not connected right or working properly.